Erika Harold, the 2003 Miss America and first-year student at Harvard Law School, defended President Bush’s faith-based initiatives at the Republican National Convention in New York earlier this month. NEW YORK—Less than 24 hours after Erika Harold addressed the Republican National Convention, she was off to first-year orientation at Harvard Law School. 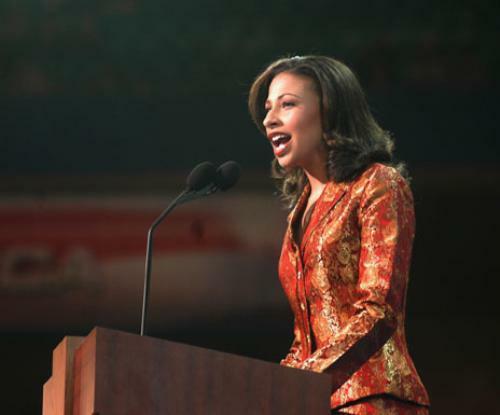 Harold, the 2003 winner of the Miss America pageant, used her four-minute speech on the second day of the Convention to defend President George W. Bush’s faith-based initiatives. “I’ve seen the triumph of the spirit first hand,” she told the crowd at Madison Square Garden in New York City on Aug. 31. Harold, who declined the Party’s offer to prepare a speech for her and instead wrote her own, talked about her visit to the Louisiana State Penitentiary, a prison which she said had experienced a 50 percent decline in violence among inmates after it implemented religious programs. “I wanted to draw upon a personal experience,” she said in an interview after the speech. Harold said that she had become aware of the power of faith-based initiatives while traveling the country for the last two years to speak about youth violence. “I saw a whole range of ways to solve problems, and faith-based initiatives seemed effective,” she said. Harold said that she had been impressed that the inmates at the Louisiana prison were not “full of despair.” They built a chapel, ran a radio station that played religious music and gave money to charity. Although Harold said afterwards that the reform of the prison wasn’t “specifically” due to one of Bush’s initiatives, she said that he had funded similar faith-based programs. Harold, who is 24 years old and African-American, was asked to address the delegates by Republican National Committee Chairman Ed Gillespie, while touring African-American communities with him. Harold said that though she did not think her race had played a factor in the decision, she thought it would attract attention. “The Republican Party has made a concerted effort to broaden its appeal,” she said. But Harold said that she had not always considered herself a Republican. “Growing up I was involved in community service, not politics,” she said. As an undergraduate political science major at the University of Illinois, however, she said that she looked at the issues and joined the GOP.